Crawley Town defender Joe McNerney is relishing the challenge of testing himself in the Football League after joining from non-league Woking. The 25-year-old made over 200 league appearances for the Cards, having joined the Surrey club aged 16. "I wanted to chance my arm at getting a move into the Football League, going full-time and seeing how far I could go," the centre-back told BBC Surrey. "It was now or never. Luckily Crawley gave me the opportunity." 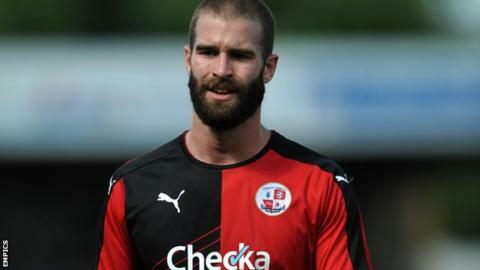 McNerney says Reds assistant manager Jimmy Dack, who used to be on the coaching staff at Woking, was influential in his move to the League Two club. "I spoke to Jimmy in the past about maybe going to Newport County but nothing really came of it," he said. "There was the opportunity to trial at a few different place, but Jimmy and Mark Yates were open that they wanted me here and to try and mould me into a league footballer. "I was impressed with it and jumped at the chance as soon as they offered me."